"Decibel Insight is analytics software that records and shows on-site visitor behavior in innovative and compelling ways that are impossible to ignore." 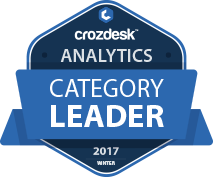 Decibel Insight scored 79/100 in the Web Analytics category. This is based on press buzz (36/100), and other relevant information on Decibel Insight gathered from around the web. Product recommendations, vendor rankings, market overview and tips on how to select Web Analytics software for business. Published in April 2019.